Is the presidential hopeful the answer to a rapid decline in financial security and mental health? 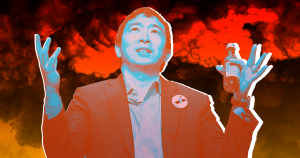 Long-shot U.S. presidential candidate Andrew Yang isn’t hopeful about the imminent future of humanity — that much become instantly clear in a bleak profile published today by The Verge. Public enemy number one: automation, which Yang sees as a destructive result of a rapidly globalizing market-obsessed future. The risk is millions of jobs lost and a host of undesirable side effects like financial insecurity and a decline in mental health — a joyless, dystopian future in which humans have been replaced by the machines they built. Yang’s core promise is to provide every U.S. citizen with $1,000 every month. That’d usually be called basic income. Yang, however, prefers to call it a “freedom dividend” — perhaps to make the idea more digestible to center-leaning voters. The idea isn’t as far fetched as you might think. A city in California recently started an experimental basic income program providing 130 residents with monthly payments over 18 months. But Yang has a long road ahead. Polls put him at around three percent. “The path from here to figuring it out is fraught with a lot of misery and suffering,” Yang said. But that’s not the end of the story. “I thought to myself, realistically, my choices are to watch the society come apart or try and galvanize energy around meaningful solutions,” he added later.